The Sopranos meets the Big Easy in an engrossing examination of a crime that rocked late-19th-century Louisiana. 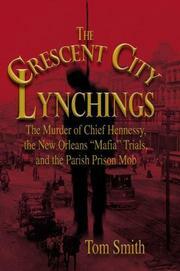 In October 1890, New Orleans police chief David Hennessy was shot dead as he walked home. Who got him? “Dagos,” said the chief, as he died. Freelance reporter Smith (Easy Target, 1996) recreates the crime and its aftermath. Nineteen Italian and Italian-American men were indicted for the chief’s murder, and what followed threatened to tear the city apart. At the first of two scheduled trials, the nine defendants got off; there was “talk of jury bribery.” The next day, an outraged mob that included some of “the best men of New Orleans,” lynched 11 of the 19 men accused of Hennessy’s murder. This in turn sparked outrage, and not only in the Italian community of New Orleans. All across the nation, Italian immigrants were incensed, holding mass meetings and calling for justice and retribution. In the midst of the uproar, Italy’s ambassador to America returned home, and there was even talk of war between the two countries. President Benjamin Harrison finally repaired international relations by sending the Italian government $25,000 to be distributed among the families of those who were lynched. Smith’s skill with dialogue lends a real vividness to this account, and his evocation of the city is captivating as he describes the years before jazz, when pianists kept playing the same tired Stephen Foster tunes, and electricity was an uncertain innovation. Unfortunately, beyond noting that the publicity surrounding the trial and lynching introduced the word “mafia” to the American public, he doesn’t explore how the events shaped America’s images of either New Orleans or Italian immigrants. An engaging account that may well strike a chord with those who now think of New Orleans as a city torn apart, but the author could have gone further in explaining the long-term consequences of the events he so painstakingly recreates.